As most of our readers will know, the Japanese word "otaku" refers to people with obsessive interests - bordering on the insane, from the point of view of an outsider - and is usually associated with anime, manga, video games and (pop) idols. "Otaku" will spend an inordinate amount of time and money in pursuing their interest/obsession. The whisky scene has its "otaku" too, of course, although many prefer to use a different nomenclature with slightly more elevated connotations. It's rare for "whisky otaku" to make any sort of impact on the world of whisky - the world outside their bedroom, that is - but every once in a while, somebody comes along whose focus is so intense that they are able to fill a void and jaws start dropping. 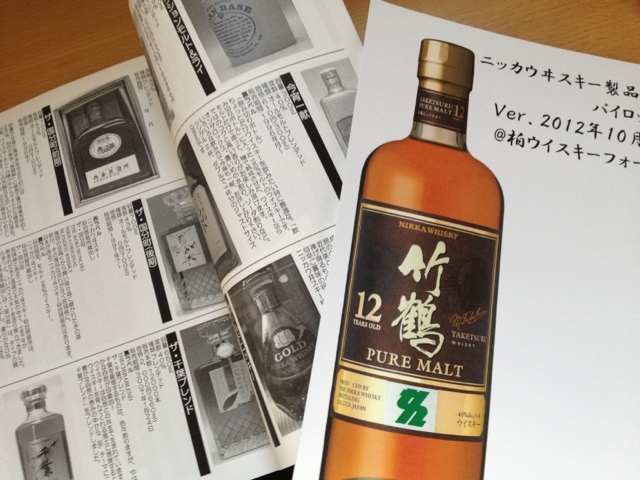 Hajime Asano is such a guy: never had any particular interest in whisky, but somehow he found himself part of Nikka's yearly "マイウイスキーづくり" program (which roughly translates as "Making Your Own Whisky"). It's run at both the Yoichi and Miyagikyo distillery and people get the chance - over two days, usually Friday/Saturday - to be part of the entire whisky-making process at the distillery. You pay next to nothing for the whole experience, and 10 years later you get a bottle of the whisky that you helped make. As you can imagine, interested parties far outnumber available places, so the whole thing is organized as a lottery. Few are lucky to get in, but Asano-san was... and it changed his life. He found himself at the Yoichi distillery in May 2012 and, apparently, got the whisky bug pretty bad. He spent the next few months digging up everything he could find about every single Nikka whisky ever released. You may think: "what's so special about that?" Well, what's special about it is that in less than half a year he self-published a book about it. And what a book it is. There are bottlings on these pages that even Nikka people didn't know existed or had forgotten existed. It's an unofficial catalogue and it's just the first version (printed in a limited edition of 100 copies), but if someone can come up with this in less than half a year... well, give him a bit more time, and he'll put together the whole puzzle. There's no doubt about that. In the meantime, if you see this, get a copy. It's one of the rare publications documenting actual whiskies rather than whisky making history, in general. I have trouble even keeping track of what we've had in Europe over the past 12 years... can't begin to imagine how many whiskies ther have been in Japan!